Dublin musician Mick Heslin has been impressing audiences in bars and clubs around the capital since he was 16 years old, so NewsFour heads off to see the bluesman live and in action. 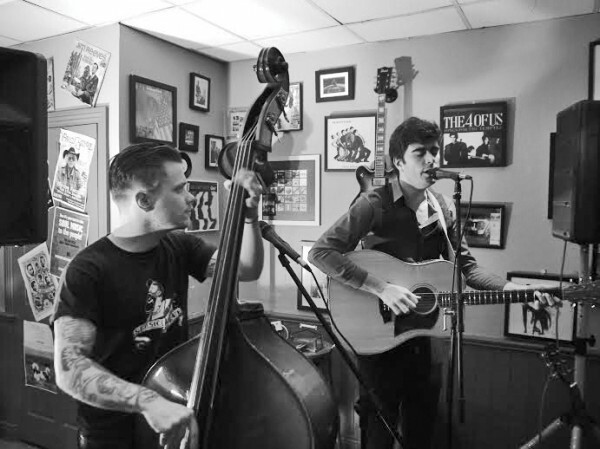 The gig takes place in a barber shop called Abner Brown’s in Rathmines on Good Friday, and features top musicians from around the city. Although it’s a barber shop, come the weekend, Abner Browns turns into a soul fuelled music venue, packed to the joint with music lovers and musicians. Mick arrives at the venue in style and wows the audience with his furious fingerpicking and soulful voice. Accompanying Mick on the night is double bass player Tim Fernley, who also impresses the crowd with his quick, effortless way of playing such a cool sounding instrument. The full line up of The Mick Heslin Band isn’t present at Abner’s, so the pair perform a duo interpretation of the original tracks from their up and coming album, which was recorded at the end of March at Charthouse Records in Drumcondra with Ian McNulty. They start off the set with Cuckoo, a cover of an old folk song. The second number is an original song called One of These Days, which will also be the name of their debut album. The songs have a bluesy, gypsy, jazzy sort of feel and, with appreciation to his guitar playing, aren’t the standard blues riffs; these songs take a lot of thought and passion. Mick has been performing live solo for years but decided to get a band together when he wanted to release his first album. Several musicians have accompanied Mick during the last two years but he recently re-recorded the album with the band as it is now, which is Tim Fernley on double bass, Adam Steele on drums and Aoife Kelly on violin. “It worked out really well, as we had over a year of solid gigging together,” Mick says. The band hopes to have the album ready for the end of July. For a musician in his twenties, Mick plays the blues with the heart and soul of a man far beyond his years. Pictured: Tim Fernley (left) and Mick Heslin (right). Image supplied by Donna Dunne.